Reply, 'To Mr Duncanson about Mr Grant'. This letter is addressed to Mr Thomas Duncanson regarding the case of the servant Robert Grant, further to his master Captain Urquhart's report of his case as conveyed via Duncanson in a previous letter. Cullen warns that the outcome in such cases is seldom favourable, but gives directions for his care. Summary Reply, 'To Mr Duncanson about Mr Grant'. 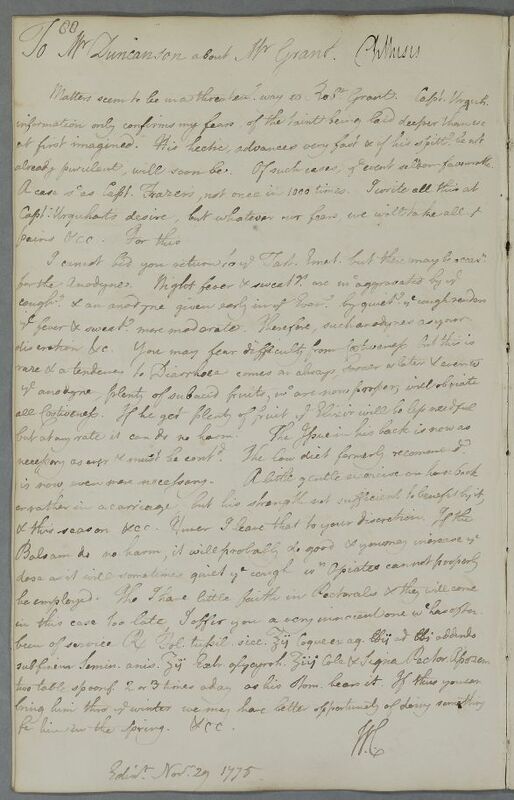 This letter is addressed to Mr Thomas Duncanson regarding the case of the servant Robert Grant, further to his master Captain Urquhart's report of his case as conveyed via Duncanson in a previous letter. Cullen warns that the outcome in such cases is seldom favourable, but gives directions for his care. Case of Captain Thomas Fraser [Frazer] who now has a fever having long taken to his bed after a long history of real and, possibly imagined, complaints. To Mr Duncanson about Mr Grant. already purulent, will soon be. Of such cases, the event seldom favourable. Take three ounces of dried Leaves of Coltsfoot boil with a liquid measure of two pounds to one pound of spring water until complete. Add two drachms of Aniseed, three drachms of Extract of Liquorice. Strain etc. Label: Pectoral Apozem, two tablespoonfuls two or three times a day. for him in the Spring. &cc. 1: Presumably an abbreviation for 'Urquhart's', as repeated later in this opening paragraph. already purulent, will soon be. Of such cases, ye event seldom favourable. I cannot bid you return to ye Tart. Emet. but there may be occasn. necessary as ever & must be contd. The low diet formerly recommend. two table spoonf. 2 or 3 times a day as his Stom. bears it.